Common pests found in the Newcastle, Central Coast, Sydney, Hunter Valley areas of NSW. Pest control around the home and business is essential to maintain a hygienic and disease free environment. Common household pests carry germs and disease which can spread to your family via surfaces in the home. The most common interior household pests in Australia are cockroaches, silverfish, spiders, ants, mice, rats, fleas, mites, ticks, bed bugs, termites, nuisance birds, possums.Cockroaches are nocturnal and infest even the cleanest homes. They feed on food scraps and drips, meats, fruits and vegetables. They also enjoy leather, glue and starches in addition to feeding on discarded human skin flakes that fall from your body onto the floor and onto furniture in your home. They also enjoy eating human dandruff and hair. This is why cockroaches infest even the cleanest homes, there is always a potential food source whenever humans inhabit a space. 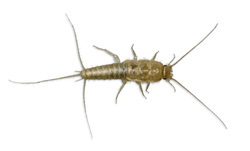 Silverfish live in dark warm places such as bathrooms and kitchens within the home. In addition to being carnivorous (meat eaters) they also eat paper, book bindings, glue, starchy substances as well as anything sugary. They eat gum and both natural and synthetic fibres of your clothes, manchester and soft furnishings. They spread disease by shedding their scales, and leaving their droppings around your home. Their inability to climb smooth surfaces means that silverfish are sometimes found trapped in sinks and bathtubs. There are hundreds of spider varieties in Australia with several poisonous and deadly varieties found in the Newcastle area. Some of the more common spiders are listed here, however there are hundreds of species that may inhabit your property or home and it is important to know which ones may be dangerous. The red back is probably the most common and well known spider in Australia. The Red Back spider's distinctive red mark sets it apart from most other species. In fact, it is only the mature female who displays the red stripe on her abdomen. The immature females have white redback spider markings on a brown body. The male of the species are small brown spiders with red and white markings. Red back spiders are more common around drier regions and enjoy webbing around buildings and on children's play equipment and other garden structures. They have been known to feed on mice and other ground dwelling animals and insects. Red back spider bites are poisonous and can be fatal to small children and the elderly. The funnel web spider can grow up to 5cm long. They feature a shiny head on a brown body. They live in burrows, inside stumps and logs which they line with a silky lining. Funnel Web spiders are highly toxic and are dangerous. Seek medical advice immediately should you be bitten. Female Funnel Webs can live up to 20 years and feed on lizards and frogs, and other insects who pass by their burrow. The males wander away from the burrow and may enter houses, tents and other dwellings. Spider bites are painful and can be dangerous. White Tail Spiders are well known for their painful bite which has been known to result in skin trauma and rashes. The white tail spider are ground dwelling spiders which are characterised by a distinctive white spot on the end of the abdomen. They have been known to seek shelter under just about anything including toys and clothes that have been left on the floor even for short periods of time. They move slowly and eat other spiders and insects. They are usually nocturnal feeders and the female can grow up to 20mm long. The Huntsman spider is large and hairy. The Huntsman spider bites rarely, however if provoked, it has been known to bite and there may be pain and swelling around the bite site. They can grow up to 15cm from leg to leg and move rapidly. It is common for the Huntsman spider to come inside your home and stand flat against walls and ceilings. The Trapdoor spider is well known in Australia and is found in many areas and regions. There are many different varieties of trapdoor. They take their name for the peculiar way they construct a flap to cover their burrow, however, keep in mind that some species of Wolf spiders also plug their burrows. The Trap door Spider feeds on crickets, moths, beetles and grasshoppers. If you are bitten by a Trap Door spider, you may experience pain and swelling. The Mouse Spider sports massive fangs and grow up to 3.5cm long in some cases. They are characterised by their large, bulbous head and a shiny black body. 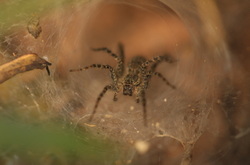 Although they are not common in built up areas, there have been Mouse Spider bites reported with symptoms similar to that of the Funnel Web. They prefer forest-like wooded areas and the male Mouse Spider has been known to wander mainly at night in search of females, although they have been noted as being out following heavy rains. The Mouse Spider is often mistaken for the Funnel Web Spider due to the similarities in appearance. Ants are extremely common in every region and state of Australia. They are found in and around the home and prefer to build their nests in existing structural flaws such as rotting woods, broken brickwork and plaster cracks. They search for food and water, with particular favourites being sweets, meats, fats, oils and garden seeds. Ants locate food sources then larger groups are recruited to transport the food back to the nest. Ants have been known to abandon their nests if they are disturbed or a food source location changes. They later return to re-inhabit the abandoned nest should food sources be located closer to the original nest. Most Australian ant species are not a health threat but rather, are categorised as more of a nuisance pest. Australian ants have also been known to eat plastic coatings of electrical wires which can cause house fires. Rodents are one of the most successful species on earth. Their ability to survive natural disasters, adverse weather conditions and harsh environmental conditions makes them a formidable adversary. Rodents are responsible for destroying millions of dollars worth of crops, stored grains and prepared foods every year. Rodents remarkable ability to develop a resistance to poisons and baits, makes it necessary to enlist the services of a professional pest control practitioner in order to successfully eradicate your rodent problem. Rodents are successful breeders and rats can produce up to 80 offspring per year with one male and female producing over 15,000 offspring during their lifetimes. The black rat is the most common rat in built up areas of Australia, and was responsible for the spread of the bubonic Plague of 1665. Its extraordinary climbing abilities, easy adaptability to harsh environments in addition to its ability to breed as young as 10 weeks old make the rat a serious threat. 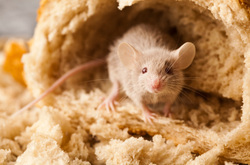 Mice can crawl through a hole less than 3cm in diameter, giving them superior access to most areas of human dwellings. Mice can reach an average population density of up to 750 mice per hectare in Australia and past plagues have been devastating to both social and environmental concerns as well as economical systems with monetary damages reaching up to AU$100 Million. In some cases the female mouse is able to mate within 3 days of being born, making the common house mouse an excellent breeder. Mice destroy electrical equipment, spread disease and damage food, personal belongings and have been known to cause house fires. Due to the mouse's ability to breed under most circumstances, their population numbers can quickly reach proportions that are difficult to manage. Mice can breed all year round, however summer is the ideal time for mouse breeding. Fleas are parasites that survive on the fur of animals, including domestic pets, humans and can also live in carpets, lounges, and other soft furnishings. Essentially, fleas feed on the blood of animals and can jump from one animal to another, spreading disease in the process. Their head and mouth are adapted for maximum efficiency in piercing skin and sucking the blood of their victims. Fleas have been known to transmit tapeworm and less commonly Marine Typhus. Fleas have 'pumps' in their mouth and gut which enable the blood to be pumped out of the victim into the body of the flea. Fleas bite and can cause reactions in some people, with the urge to scratch difficult to resist, secondary infections are common. Adult fleas can go months at a time without food, making infestations of holiday properties and rental houses possible. The tiny nature of fleas make it difficult to eradicate them completely from the home. Professional pest control is necessary in most cases as eggs can hatch after self fumigation has occurred enabling another infestation. Ticks are blood sucking parasites with the most common tick in Australia being the paralysis tick. Ticks lay their eggs in leafy matter and drop from trees onto animals or clotheslines and from there they find their victim. Ticks attach themselves to a host animal (including Humans) and feed on their blood. Ticks can cause an allergic reaction in humans and are transported by their hosts to the next host. Ticks can live up to a year. Tick borne diseases can be life threatening and medical attention is essential in these situations. Mites are microscopic species of parasitic invertebrates that live on plants and animals or in soil or water. The most well known mites are dust mites, that live almost exclusively in the home. Mites are known as arachnids, closely related to spiders with over 3000 species known in Australia. Mites damage plants by piercing the leaves and sucking out the sap. Humans and animals can have adverse reactions to these parasites as they have been known to spread skin conditions such as mange and scabies and be responsible for allergies and asthma in humans. Mites have also been known to live in stored food. Bed bugs were well known in the mid 20th century and have recently become more of a pest with more cases reported recently than in the last 50 years. 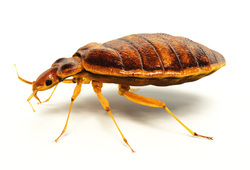 Bed bugs are wingless insects that have been known to grow up to 5mm long. They feed on blood which causes them to change colour from a rust brown to a deep red brown when they are full of blood and each bug can live up to 12 months. Females lay 2-3 eggs per day and they can survive for long periods without blood. They do not live on their hosts, (mainly humans) but like to lay quietly during the day to digest their blood meal before re-attaching themselves to their hosts for another feed during the night. 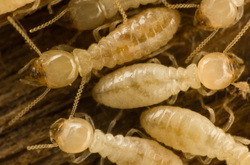 It is illegal for you to treat your own termites and the services of a professional pest controller is necessary in order to eradicate these pests. Termites are resilient and are difficult to locate and treat. Hunter United Pest Control are well trained and experienced in methods relating to termites and can offer a full service to put your mind at ease. Termites are attracted to wood and water as well as humid conditions. Termites are often confused with ants, however termites have both a queen and a king and some species have more than one egg-laying queen. Termites live in colonies that can be inhabited by millions of individuals all working together to exploit food sources available to them. The 'hive mentality' means that termites are able to share foraging, food storage, hive maintenance and other duties in order to exist more efficiently. At certain times of the year, winged termites fly away from the nest to locate alternative food sources. One way to know if there is a termite nest nearby is when large numbers of fertile winged termites fly about near your home. Termites are usually sensitive to light and rarely emerge from the nest which are usually located under the house. Termites can cause incredible damage to your home and can destroy structural timbers within 6 months depending on colony size. A licensed pest controller is essential to eradicate termite infestations in your home. Birds can be destructive when they choose to nest in and around your home, under eaves and inside your roof. Mainly Pigeons and Minor Birds are problematic in the Newcastle area. Our methods of bird removal are kind both to the environment and the birds. The birds are removed and set free away from your home and your home is then bird proofed in an environmentally responsible way. Feral pigeons do not migrate and stay close to their birth place, which may be your home or office. Feral pigeons are attracted to food sources around your home such as outdoor dog bowls, food rubbish and bird baths/feeders. Pigeons leave droppings around your home which can be a possible health hazard and due to their acidic nature, can cause damage to your home including drain blockage. Removing food sources permanently, proper pigeon proofing and removal of nests can deter the birds from returning following trapping. Brush tail possums can grow to the size of a domestic cat and are problematic when they move into your roof. These Australian native marsupials can cause havoc in and around the home and generally resort to living in roofs when native gum trees are felled. Possums who live in roofs of houses can cause damage to roof interiors as well as making loud noises at night. Possums love apples and these make good trap bait for our humane traps. Our trapping methods are humane and no possums are harmed, but are set free following trapping. Possums are fast moving and have been known to scratch if confronted. You will need to enlist the help of a licensed pest controller to safely catch and re-home possums.